In 1899, Secretary of State Hay made a bold move to acquire China’s vast markets for American access by introducing Open Door notes, a series of circular notes that Hay himself drafted as an expression of U.S. interests in the region and sent to the other competing powers ([link]). These notes, if agreed to by the other five nations maintaining spheres of influences in China, would erase all spheres and essentially open all doors to free trade, with no special tariffs or transportation controls that would give unfair advantages to one country over another. Specifically, the notes required that all countries agree to maintain free access to all treaty ports in China, to pay railroad charges and harbor fees (with no special access), and that only China would be permitted to collect any taxes on trade within its borders. 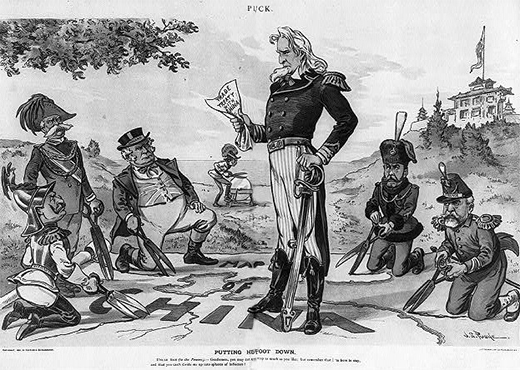 While on paper, the Open Door notes would offer equal access to all, the reality was that it greatly favored the United States. Free trade in China would give American businesses the ultimate advantage, as American companies were producing higher-quality goods than other countries, and were doing so more efficiently and less expensively. The “open doors” would flood the Chinese market with American goods, virtually squeezing other countries out of the market. 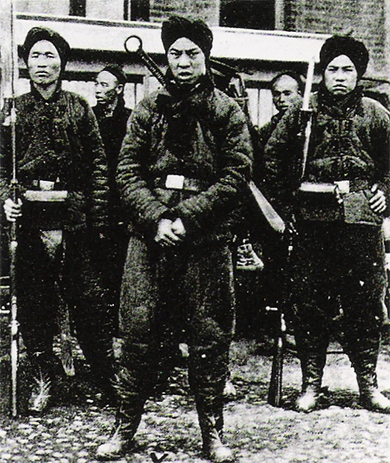 The notes were invoked barely a year later, when a group of Chinese insurgents, the Righteous and Harmonious Fists—also known as the Boxer Rebellion—fought to expel all western nations and their influences from China ([link]). The United States, along with Great Britain and Germany, sent over two thousand troops to withstand the rebellion. The troops signified American commitment to the territorial integrity of China, albeit one flooded with American products. Despite subsequent efforts, by Japan in particular, to undermine Chinese authority in 1915 and again during the Manchurian crisis of 1931, the United States remained resolute in defense of the open door principles through World War II. Only when China turned to communism in 1949 following an intense civil war did the principle become relatively meaningless. However, for nearly half a century, U.S. military involvement and a continued relationship with the Chinese government cemented their roles as preferred trading partners, illustrating how the country used economic power, as well as military might, to grow its empire. Economic Imperialism in East Asia by OpenStaxCollege is licensed under a Creative Commons Attribution 4.0 International License, except where otherwise noted.